All the bright flavors of Spring coming to you in a crispy, chewy cookie! 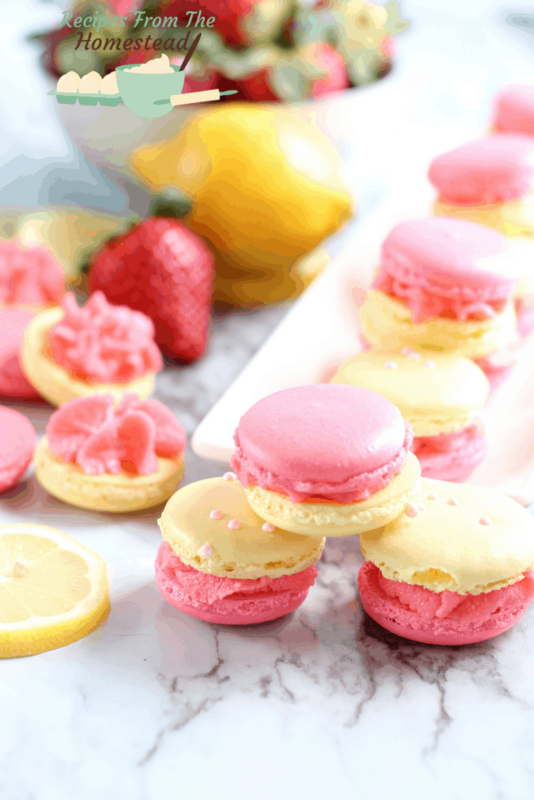 These strawberry lemonade macarons make the perfect treat for Mother’s Day! Sunshine, bright colors, and all things pretty. That is the hallmark of Spring. When the earth awakens from it’s winter slumber, and brings forth the new life, with all shades of every color imaginable. Spring is probably my favorite time of year, for the reason of color. I love the bright colors, the blue of the sky, the flowers that bloom. It’s a wonderland out there, that can only be seconded by the explosion of deep colors come fall. 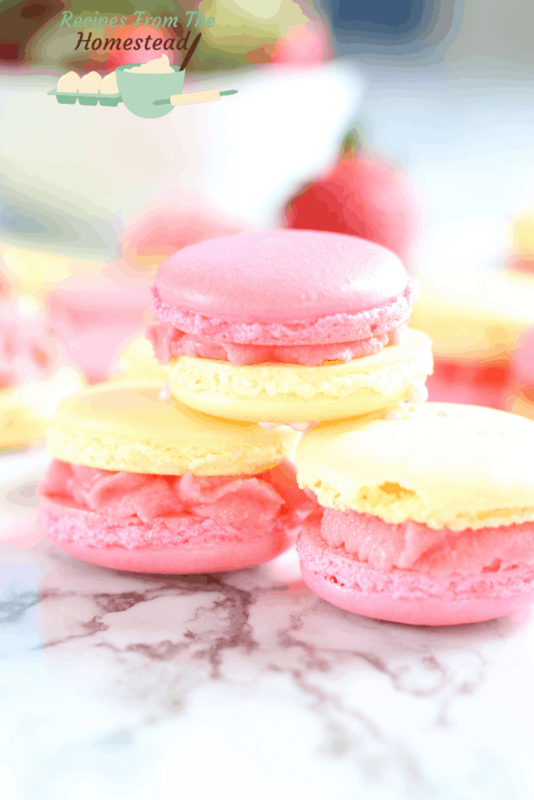 My love for Spring was the inspiration behind these strawberry lemonade macarons. 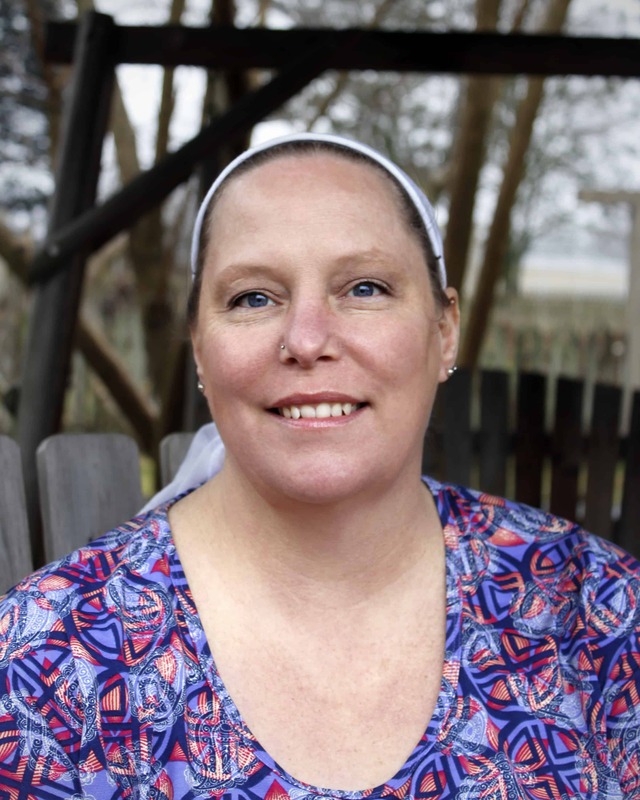 When my kids were younger, Spring meant that we could spend hours at the strawberry farm, picking the ripe juicy berries and loading them into our baskets. At home, we would make all sorts of strawberry preserves, and gallons of strawberry lemonade. Oh, the sweet, juicy tang of it! No wonder we had to enjoy it to the fullest-it never lasted long enough. 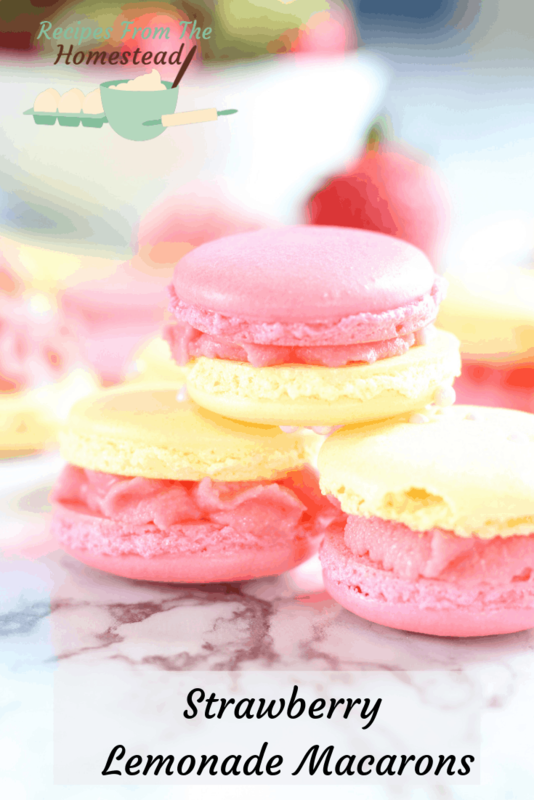 Strawberry and lemon-they were made for each other. Like 2 peas in a pod. Peanut butter and jelly. Peas and carrots. 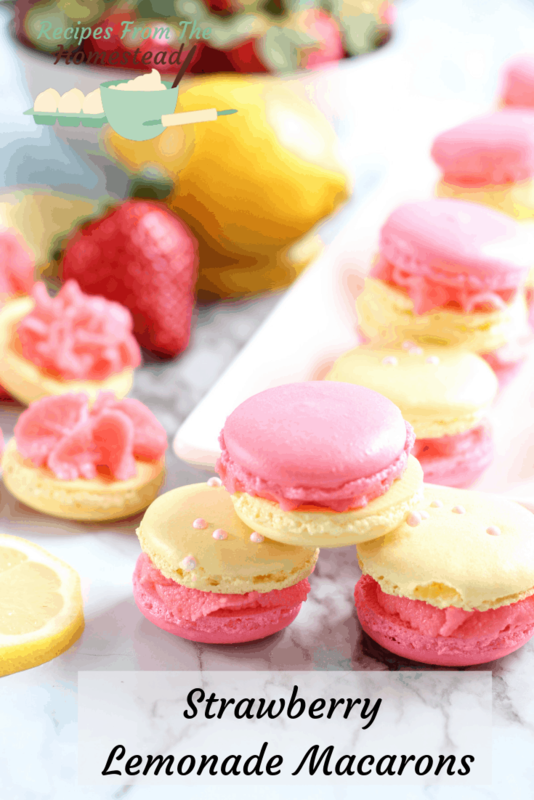 What I love about these strawberry lemonade macarons is not only how delightful they taste, they are a beautiful gift as well. 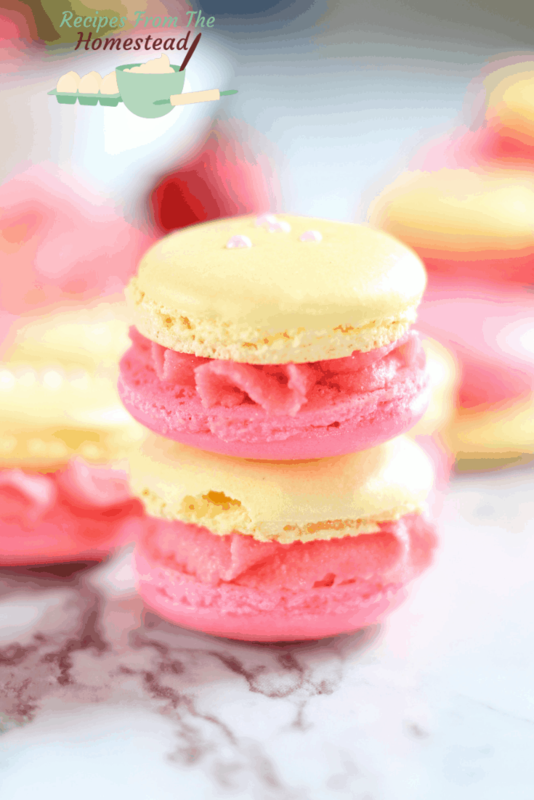 My neighbors love when I test new macaron flavors, as they get to test them right along with us. My next door neighbor fully enjoyed the beauty of this cookie, and she thought they were a great flavor, too. Learning how to make French macarons takes some time, and patience. It takes getting the batter just right and piping it in equalish circles, and getting the oven temp at the perfect level. But, it’s worth the effort. Grind, grind, grind your flour and powdered sugar. Run the mixture through a blender or food processor to help remove chunks. Chunks=no bueno, as they will overpower the egg whites and your cookies will fail. 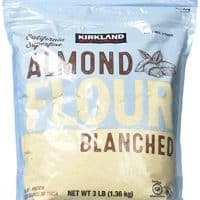 Place almond flour and powdered sugar in a blender or food processor. Blend together for 2-3 minutes to remove any chunks and make sure they are super fine. 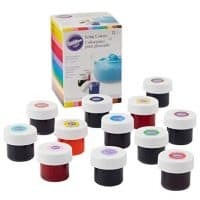 Sift through sifter 2 times, removing any leftover chunks and reblending. After the second time, toss any leftover chunks that remain. Set aside. Divide your batter in 1/2 and add lemon extract and 1/2 teaspoon lemon coloring to one batch. Add 1 teaspoon strawberry extract and pink food coloring to the other. Mix each batter carefully to blend, keeping them separate. Place yellow batter into a pastry bag with a small round tip. 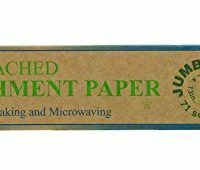 Make 1 1/2 inch rounds on the parchment paper, about 1 inch apart. Carefully tap the sheets on the counter to remove any air bubbles, and allow the cookies to dry. Preheat the oven to 325 degrees, and place an empty baking sheet on the top rack. This will keep the cookies from over browning. 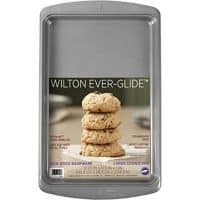 Set the baking sheet with the cookies, working with one sheet at a time, on the middle rack. To make the buttercream, place softened butter and powdered sugar in a mixing bowl. Whip until light and fluffy. 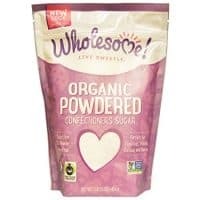 Add strawberry extract, and 1/4 teaspoon pink food coloring and blend well. What treat are you going to enjoy this Spring? 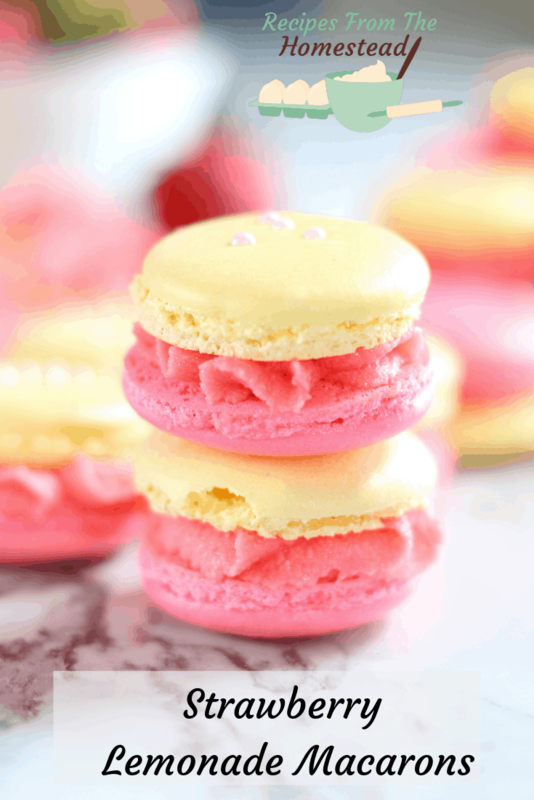 Will you try these Strawberry Lemonade Macarons? Be sure to let me know what you think!